My name is Cédric Menendez, I’m 35, and I’m a composer and sound designer for Midgar Studio, a video games studio in Nîmes, in the south of France, that’s been in the business since 2008. Music is my passion, especially video game music. Where did your passion for video games and music come from? I think that playing video games when I was much younger sparked my passion for music. It made me think, “It’s amazing how music can add something special to the images!” Especially back when the graphics were really coming on and the music started to add an incredible dimension to the limited pixels, so much so that the music and the images had to vie for attention. I thought it had a really powerful emotional impact and that’s what I liked. And I think that’s why I make music. It’s really to make people feel something, whether to make them feel sad, happy, whatever, and to make people feel alive. Going back to video games, do you have any childhood favorites? Wow, they’re not bad games! No, not at all (laughing)! Can you tell us a bit about the first projects you worked on? Perhaps even before Midgar Studio. I’ve worked on an awful lot of musical projects in my time. It started with small bands when I was a kid in the 90s. After that, I wanted to be a high-school music teacher, so I did the training for that, at the local teacher-training school, but I realized that it was much more about teaching than the music itself and that the music itself was simply a tool. After a few years, I realized that it wasn’t for me and that I wanted to perform and write music. So I played a lot with a lot of different groups and in different styles. Everything from metal to pop, via jazz, blues and then techno. I’ve also been a hard techno DJ for about 15 or so years, so I made a bit of a niche for myself there for ten or so years. And now I’m really focusing on composing and only composing. I stopped doing shows because I have a family, kids, all of that, and I didn’t have the time to travel all weekend. Now, it’s composing in the studio and that’s it. So I’ve had a lot of projects. I really started at Midgar before I joined the team properly. I worked for them as a freelancer and then afterward I really wanted to join the team and get a bit of stability from that. Right. I’ve heard a little story about how you joined the team at Midgar Studio. Can you share it with us? I was my current boss’s piano teacher. At the time, he was at high school and I was the piano teacher at a charity in Salon-de-Provence in southern France. He started setting up his company, so when he needed a composer, I think he trusted me and called me there and then. And I’m still here (laughing). So he got in touch with you as a composer, but you’ve also done sound design on the games you’re working on at the moment, haven’t you? That’s right. It was something I’d never done before. So I learned on the job and I’m improving every day. And I write everything down. I don’t have the same facilities as the big studios with all the gear that a foley artist needs, but I get by with what I have. And the results aren’t bad. Take Hover or the Edge of Eternity, the game that Midgar is currently developing. Can you talk about your creative process for when you’re composing music? I draw heavily on what has already been done in a particular style or on the emotion we want to project. For example, for a character theme, I’ll see what character they’re like in other games to see how other composers, the great composers, mainly the Japanese composers, have approached things. Then I analyze the character, I look at the sheet music and I crack the code a bit. How they’ve composed and orchestrated the music and used the orchestra. Then I’m more or less set on the melodies, so I try to stay on that track. This is how old-school composers for video games composed. Like I said a bit earlier, the music should really be at the forefront, with really clear melodies to add a bit of feeling when this is missing from the visual side of things. Now we’re in much more of a film-music mode for big games like Skyrim, with sprawling environments and moods. I prefer music that sounds a bit old school. Actually, no, not old school. What I mean is with modern instruments, but compositions that retain the originality of old-school video games. I think we’ve lost that a bit now by becoming more like film music. When I’m composing, I try to start off with a melody, whether on the flute, the violin or the piano, and try to find harmonies on top of it and add the rhythm last. That’s how I normally do it, but it depends. If I need something really rhythmical, I’ll maybe start with the rhythm, but I find it’s best to start with the melody that really shows what I have in mind. Do you have any favorite elements to work with? For example, at Midgar, do you work with artwork or gameplay videos? Because we’re not a big studio and we don’t simply want to add music after everything else is finished, we really have to work together as intensely as possible, so, yes, I like to see the visuals as much as possible. The more I have of them, the easier it is for me. So artwork is great. The best thing is being able to play the game. That’s how it was for Hover and it really helped me match the images and the moods So as much as possible. If I don’t have all of that, if I don’t have access to it and if I know that I’m going to need a lot of time and I don’t have a lot, I’ll try to snoop around for info from the graphic designers, the programmers, the level designers, and so on. I can make little changes once I have the images. 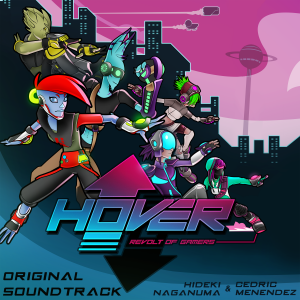 Can you tell us a bit about what you were trying to do when you composed the music for Hover? With Hover, I really wanted to work on the dynamic music, which was what I liked most when I played the game. That meant being able to jump really high, having that verticality but also that horizontality with the tempo. I really wanted the music to give an extra dimension to all of that. That’s why I used pretty fast rhythms for the races, something quite uptempo and drum ‘n’ bass, with pretty epic synths to give an effect like “wow, incredible, you jump super high, you fly, you go really quickly and bounce everywhere.” I also did it to complement a game that used really bright, quite flashy colors with flares, everything really showy, so I added lots of color to the music with really new-school “EDM-like” synths. You worked on that original soundtrack with Hideki Naganuma, the Jet Set Radio composer. Can you tell us how you met and then how you ended up working together on the soundtrack? I didn’t get in contact with him. The game’s developers did. You should know that they’re the ones who created the game: they’re Fusty Game. It’s a small studio that took on Midgar Studio, so it’s a separate team. At the start, I wasn’t working on this project, but when they needed music for Edge of Eternity, they asked for my help. I joined the team and, at the same time, they got in touch with Hideki Naganuma, the composer of Jet Set Radio, a game that really made an impact on them. So contrary to what a lot of people say, Hover is not the spiritual successor of Jet Set Radio. But it is influenced by it quite a bit. So all the same, getting in touch with Naganuma was a nice nod to the game. I met him when he had properly started working on the game and we connected on the style and because the developers weren’t great with the music. They asked me if this worked or if that didn’t. When I got in touch with him, he sent me some previews and then his finished tracks. For me, this was very Hideki Naganuma. Then, when I’d already done most of the OST, he came in with two tracks. They didn’t really fit with what I’d done. I wasn’t going to redo everything, so I used his tracks in the smartest way possible. We couldn’t use them in the background music for the levels because they were a bit funky with lots of vocals, very song-like. For me, they were more atmospheric, so we used them for the races. So I didn’t really have much more contact with him than that. He did his tracks, send them to us and that’s it. I kick-started us working with Yasunori Mitsuda on Edge of Eternity. So working with Yasunori Mitsuda was your idea? Yes, absolutely. We didn’t know Hideki Naganuma at all before working with him. I’d never played Jet Set Radio. It wasn’t really of my generation. I’m a bit too old. But Mitsuda, well, Chrono Trigger. When we did the Kickstarter for Edge of Eternity, I thought we needed to guest to liven things up. So I contacted several people. In any case, he was the one we really wanted to work with. I’d thought about Nobuo Uematsu, but at the time, he was already involved in another Kickstarter called Project Phoenix, so that didn’t really help. I think that Mitsuda really helped us get backers and then he created some exceptional music. Incredible stuff. And I could really work well with him, well, not on composition—he does very well on his own (laughing). I was lucky enough to see the sheet music and I learn something every day from it. So I went to the recording with the orchestra in Bratislava last year, in February, and I saw how they worked in this extremely professional way, both as individuals and as an orchestra. In one week, I learned more than in years of composing. It taught me so much. Speaking of the orchestra, was that your first experience of one? For the first Kickstarter, I did the trailer music and I wanted it to be amazing, so we contacted a Parisian orchestra called Symphonifilm conducted by Steve Journey, a super cool guy and a great conductor who organizes sessions for people who aren’t so well off. They’re attended by ten or so, even fifteen or so professional musicians from leading orchestras who are, quote, in his circle of friends, unquote. He records sessions in a little studio in Montreuil (eastern Paris) with four or five violins, then the whole violin section, the cellos, woodwind, and brass. He does several recordings at the studio. And then he overlays them with help from a sound engineer who adds the feel of a large orchestra. It works really well. So that was my first experience in Paris, but after, when I went to Bratislava, where there really was an orchestra with a hundred or so musicians and forty singers in a large recording studio, it was something else. But the approach was pretty similar in the end. In your opinion, what does an orchestra bring to the music? I think that despite all the good orchestra VSTs on the market, they don’t compare to what professionals do when they play: they add the real emotion that you need, the right touch. A keyboard can never replace a professional violinist. And it’s the same for every instrument at the end of the day. So for realistic sound and the skill of the instrumentalist, there’s nothing like it. It’s something else. But it’s very expensive, so not everyone can do it. Going back to Edge of Eternity, can you tell us a bit about what you wanted to achieve for that project and for Hover, and maybe how you made the OST? By that, I mean does it work like lots of role-playing games with a character theme, a battle theme, and a fanfare? We organized it like this: we asked Mitsuda to do the character themes, the really dynamic music, like the battle theme, which turned out to be the main theme because it had something epic about it with the vocals. He said it himself, I think, that it worked as the main theme and the battle theme. So he did all of the more dramatic stuff and the incidental music, and I did all of the background music and anything else that we couldn’t afford to do. But because I work directly with the designers who are in the office next door, I can go and see what they’re doing. I can ask them how they see something, what they’re trying to do, why they’re using a particular color, why they want a specific plant, why they’ve decided on a particular building—and this really helps me to create the music. I was really happy because people said that the orchestra really adds another level of realism, another dimension. But people don’t always notice the difference between Mitsuda’s work and my work in the game. So it’s really flattering for me and it shows me that an indie studio like ours doesn’t have to spend thousands of euros to have a one-hour OST just by an orchestra. But we’ll see. If we can do it, we’ll do it as much as possible. Can you give us a clearer idea of your aim? Was it to pay homage to Japanese role-playing games? As I said earlier, I really love the excitement of old role-playing games like Chrono Trigger, Secret of Mana, Final Fantasy VI or VII, and I wanted to rediscover that. Well, the Japanese haven’t really lost it. And when I asked them, they wondered why I was approaching it like that (laughing). But it’s true that in more western role-playing games like Fallout or Skyrim, it’s more about the mood, so I tried to recreate that. And I realized that it’s difficult, for example, to use pretty dynamic music with a strong melody when you have an open world because gamers are likely to spend hours and hours in the same environment and it’s quite hard to listen to that after about half an hour. So I ate humble pie and I tried to make the mood more subtle, but I tried to keep the same approach that we had for the game, meaning an old-school Japanese role-playing game with cutting-edge graphics and-hyper modern tech. So I tried to use the best sound and keep the old-school spirit in the composition with a score that could come to the fore, albeit not everywhere. I was in complete research mode to see what position the music would occupy in the game. 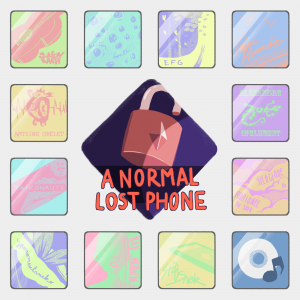 You’ve composed a song for the game A Normal Lost Phone with singer Charlotte De Lilla. That’s a completely different genre. There’s little common ground between the three games we’ve spoken about: Hover, Edge of Eternity and A Normal Lost Phone. As a composer, can you work in all genres and do you have a favorite? 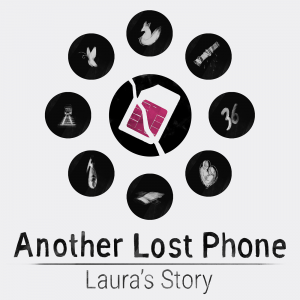 For A Normal Lost Phone, it was a big challenge for me because I can’t sing, so I couldn’t sing it myself and they really wanted something very song-like, a bit like Life is Strange in the background, full of emotion, guitar, and vocals. So it wasn’t something I was used to doing. I’ve dipped my toe a bit in all styles, so I ought to be able to do it and I know very talented singers, like Charlotte or Mioune, whom I was able to work with on Edge of Eternity. Mioune is a singer who does amazing covers on YouTube and she’s is insanely talented. So I normally work with her. On this, I worked with Charlotte, who is also very talented. She has a unique quality to her voice, more alto, but I adapted to it and I think that because it adds emotion to the music, it won’t be a problem for me. So the style doesn’t matter. The style is just a name. It’s a way of putting different genres into boxes that people can easily spot. I really like a challenge. So I gladly worked on this project. It’s quite tricky, but if I had to say one game, a soundtrack for a video game and a composer… But they don’t have to be connected? Just one genre that I like the most? Which has made the most impact on you? I would say the opera from Final Fantasy VI. In my opinion, it’s a masterpiece. It’s up there with the work of the best classical composers. It’s just four or five different channels (laughing) and completely off-key sounds, but they give it an edge that I still can’t explain. You can actually see the impact in Distant Worlds or Tour de Japon when Nobuo Uematsu had the chance to perform it with a real orchestra. It’s incredible. I would say that he’s my favorite composer, even though I love Mitsuda, and Shimomura because he gets the simple things right. He makes the most impact with the simplest harmonies and melodies. Like Chopin said, the hardest thing about composing is making everything simple so that it resonates with as many people as possible and makes them feel as many emotions as possible. Penultimate question: so, you’ve already spoken a bit about this at the start of the interview, but what role does a composer’s music play in a video game? What should it add that a graphic designer, a developer or whoever can’t add? That’s quite a tricky question. You could say that in old-school video games, for me, it was 50% about the game. By that, I mean that there wasn’t much besides the gameplay. Now, in a lot of games, people mute the sound and put on music in the background. It also depends on the style of the game, but when it’s a repetitive thing and not a great masterpiece, generally people end up muting the sound and putting on some music. So it’s become less important, but it’s still essential for me because it adds an extra dramatic dimension and it’s become something that really supports the graphics. It’s like in a film: If you don’t have any music in a film, you can still watch it, but it won’t be as good. To finish off, are you currently working on any potential or future projects besides Edge of Eternity? Are there any video game projects or genres of games that you’d like to work on in the future? No, not at the moment. We’re really busy with Edge of Eternity and will be until next year. But in any case, I’m part of the Midgar team, so afterward we’ll talk about our next project and I think that could be anything. I’ll add my thing to it and then there you go. What I’d really like to do is a neo-retro game like a slightly pixelated platform game. After that, what I really like is orchestral music because for me it’s really about complete pieces of work. Maybe in the next one, there’ll be a bit of a hybrid between electronica, rock, drums, dirty guitars, and symphonic music. For Edge, I really decided to create symphonic music and nothing else, perhaps a piano, but if I could add a harp instead, why not? And then, of course, there’ll be the sequel to Edge to continue the tradition (laughing). After that, I don’t know what the future holds. And thank you, too. It was a pleasure to talk about what we’ve been up to (laughing). A new vinyl edition for Endless Legend! 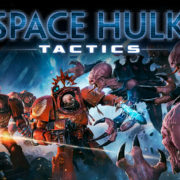 The original soundtrack to Space Hulk: Tactics is available now!